Aspen leaves become translucent as the turn golden during their autumn peak. Standing within an aspen grove with the sun above is an amazing experience. The aspen leaves cast a soft yellow gold on the entire forest canopy and floor. 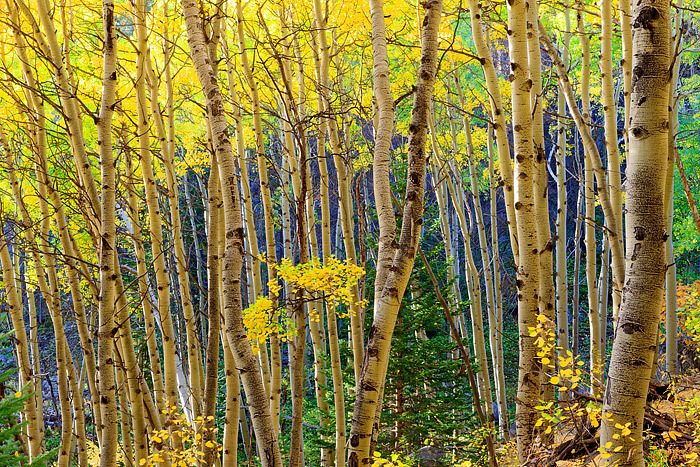 These aspen trees located near the Bear Lake area where doing just that the day I photographed them. Finding a good composition of this particular stand was difficult, but the light was just to beautiful to walk away from without attempting to create an image. I finally found a juxtaposition of aspen boles and leaves that I really liked. The smell of the fall forest, elk bugling down below and the golden colors made for an unforgettable experience in Rocky Mountain National Park on this day. Photo © copyright by Thomas Mangan.